Poppy Tooker is a well-regarded New Orleans cooking instructor. 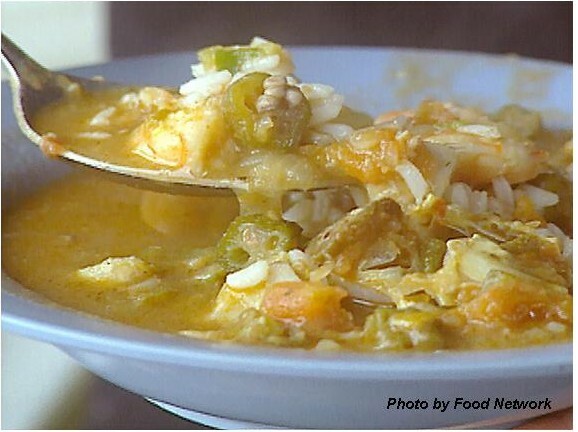 This is the gumbo she used to defeat Bobby Flay in a Gumbo Throwdown. Peel shrimp and combine peels, onion skins, and tops in a stock pot. Cover with water and boil for 10 minutes. Fry okra in very hot oil until lightly browned. Make a dark roux with the flour and oil, cooking to the color of milk chocolate brown. Add onions, stirring together until the roux darkens to a bittersweet chocolate brown. Add celery and bellpepper. Saute for five minutes, then add the gumbo crabs, tomatoes okra, herbs, and the shrimp stock. Add garlic and salt and pepper to taste. Simmer 45 minutes or longer. 10 minutes before serving add shrimp and green onions. Serve on top of cooked rice.